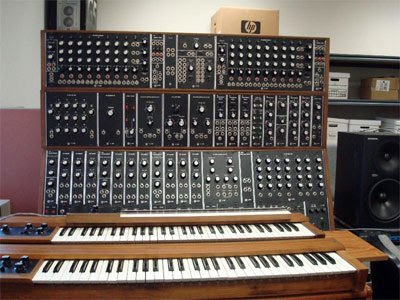 Music Thing: Q: What happens if you find a vast Moog Modular from 1969 in a cupboad at work? Q: What happens if you find a vast Moog Modular from 1969 in a cupboad at work? it's so beautiful . . ..
...please can someone think of some good 'coming out of the closet' jokes? Yeah, what ever happened to the days when people could say, "Hey, congratulations! You are very lucky!" Geez, hasn't anyone seen the Antiques Road Show before? I'm amazed that Buck Owens actually bought this. I can't imagine any of today's country stars doing something nearly as interesting. In addition to being a successful musician, Buck Owens was a good businessman and I guess he would have had money to play with. I think it's cool he chose to experiment with new things such as the Moog, at least supporting his fellow musicians and their new ideas. Outstanding find, indeed. Simply beautiful. Though honestly, I've witnessed nastier threads over at matrix's site - just post any random twiddly "someone bought a Buchla instead of a new car" 200e demo to watch the sparks fly. Wisely, he disallows anonymous comments these days. Another reason that Matrix disallows anonymous comments is that too many people were calling him out on posting shady referral links to ebay scammers and thieves. Ahh to think I've lived just miles away from the Crystal Palace. Hell I just had dinner there a few months ago. wow. what a find. the bizarre feeback he's had from the 'community' is hilarious. who are these jack asses ? Many of those posts are irrelevant. Well.. the most amusing thing is the HP box in the back. Was it put there before the moog...? I feel embarassed for liking synths when I read such things from people with the same taste. I mean, good for him, geez, I wish I had a strike of luck like that, that's all. Its true, it becomes very apparent who the snooty know-it-alls in the synth community are when you read the comments that say "put it back and don't touch it!" I've always had a theory that people make amazing finds like this for a reason. Who knows? mayboe the guy who owns it will find a way to put it to good use. My parents had this record -- it had to be my introduction to the Moog sound.